Think you could never go vegan? Think again. As this smart, funny and persuasive manifesto makes clear, you're already 90% vegan anyway. That's right--you already love animals and are slowly but surely eating less meat than you used to. With the insider tips and inspiring stories in this book, you'll be ready to go whole hog (see what we did there?) and eat vegan for good. With a loyal online following that’s growing fast, the Bros are the new face of veganism--loud, proud, and fighting for a better world, one plate at a time. The Vegan Bros, Matt Letten and Phil Letten, are brothers (and bros) who have transformed their lives by adopting a vegan lifestyle. Popular bloggers, health/fitness consultants, and animal-rights advocates, they've been featured in mainstream media outlets such as VICE, Business Insider, Fast Company, CW, and the Guardian. And they're just getting started. "Hilarious and informative. 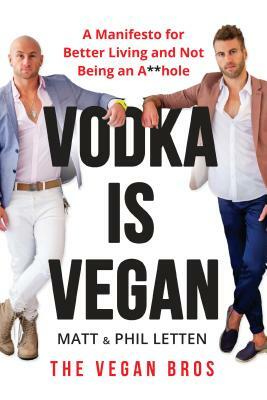 Vodka Is Vegan is one of the funniest books I’ve read. If you like dogs and don’t want to eat them then this book is for you."